Staging Race casts a spotlight on the generation of black artists who came of age between 1890 and World War I in an era of Jim Crow segregation and heightened racial tensions. 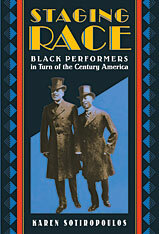 As public entertainment expanded through vaudeville, minstrel shows, and world’s fairs, black performers, like the stage duo of Bert Williams and George Walker, used the conventions of blackface to appear in front of, and appeal to, white audiences. At the same time, they communicated a leitmotif of black cultural humor and political comment to the black audiences segregated in balcony seats. With ingenuity and innovation, they enacted racial stereotypes onstage while hoping to unmask the fictions that upheld them offstage. Drawing extensively on black newspapers and commentary of the period, Karen Sotiropoulos shows how black performers and composers participated in a politically charged debate about the role of the expressive arts in the struggle for equality. Despite the racial violence, disenfranchisement, and the segregation of virtually all public space, they used America’s new businesses of popular entertainment as vehicles for their own creativity and as spheres for political engagement. The story of how African Americans entered the stage door and transformed popular culture is a largely untold story. Although ultimately unable to erase racist stereotypes, these pioneering artists brought black music and dance into America’s mainstream and helped to spur racial advancement.